First up, I just want to say that there is more than one way to achieve success sewing with knits, and your way is the best way for you. Don't let anyone else tell you otherwise. This post is aimed at those who do not have an overlocker/serger (or those who don't want to use one) and I'd like to point out that you do not need an overlocker to sew up Bronte. In fact, I didn't touch my overlocker the entire time I was drafting up the pattern, just so I could be completely sure that one wasn't needed for any stage of the construction process. But obviously, feel free to use one if you have one. When I first started sewing with knits, I sat down at my machine and literally just played with all the different settings in all kinds of different combinations to see what worked for me, my machine and my fabric. So, the suggestions below are merely that, they're suggestions and they are what worked for me. I encourage you to do things your way if what I suggest doesn't work, because we're human, and if one way worked for everyone, it'd be a boring place indeed! I cannot emphasise this point enough - you need to test your settings on your fashion fabric first. One other thing I'd like to point out before we get started is that it's a really good idea to have your machine manual close by. Let's be honest, a lot of confident sewers have probably never read their manuals (me included!) and I was totally amazed by the wealth of knowledge contained within when I actually made the time to read it (I know, it was a face palm moment) and I seriously had no idea how little I knew about my particular machine and what it could do until I looked through it. I think the number one reason for why I was scared of sewing with knits had everything to do with that darn zigzag stitch. You see, almost everywhere, people tell you that you have to sew knits with a zigzag. Okay, that's fine, but every time I would read that, my brain always pictured the big kind of zigzag that you use for applique or to finish off edges if you didn't have an overlocker. And my reaction was always, "But, how can that be a strong stitch? It's going to pull apart the moment I try to put this over my head!" What wasn't clicking for me was that, ummmm, Jen, it needs to be a narrow zigzag (or small zigzag or however you want to say it). "Oh...." *blush*. For many of you, this revelation of mine probably has you banging your head against the wall screaming "DUH!!!!" but for me, it just wasn't that obvious. I hardly ever use my zigzag stitch, and when I had, it was only on the bigger setting for applique, hence why this had just never occurred to me before. Behold, Exhibit A - narrow zigzag (left) and big zigzag (right). Use the narrow one my friends - mine is quite short in the example, but a longer narrow zigzag will work fine too. 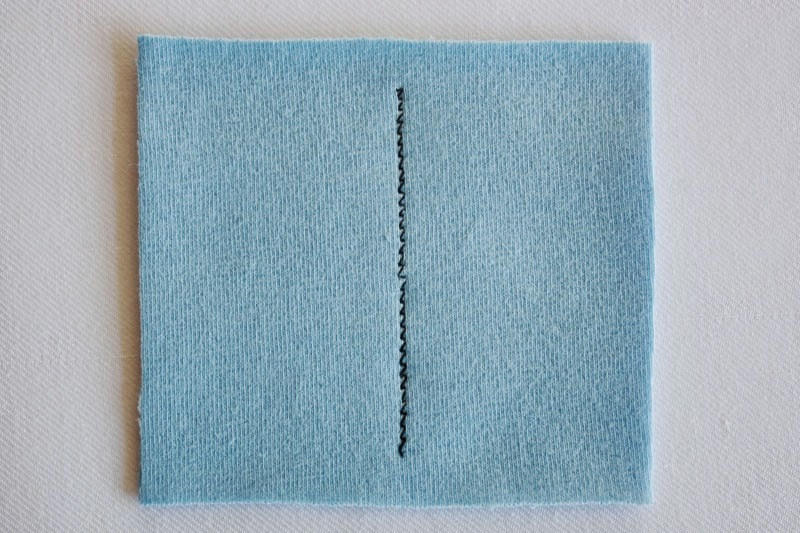 Now, if you have a lightening bolt stitch (which my sewing machine manual actually calls the Outline Stretch Stitch) you can also use this stitch for sewing with knits. In fact, after reading my sewing machine manual, and it telling me that the lightening bolt stitch is the stitch you should use for knits, I played around, and it worked for me. It's designed to "eliminate puckering on knit fabrics and bias seams, while permitting the seam to be pressed completely flat" - well, thanks for that great explanation Janome! Now, I want to quickly address the 'straight stitch' elephant in the room before we do anything else. Many many people will tell you that you cannot use a straight stitch on a knit, when actually, that depends. 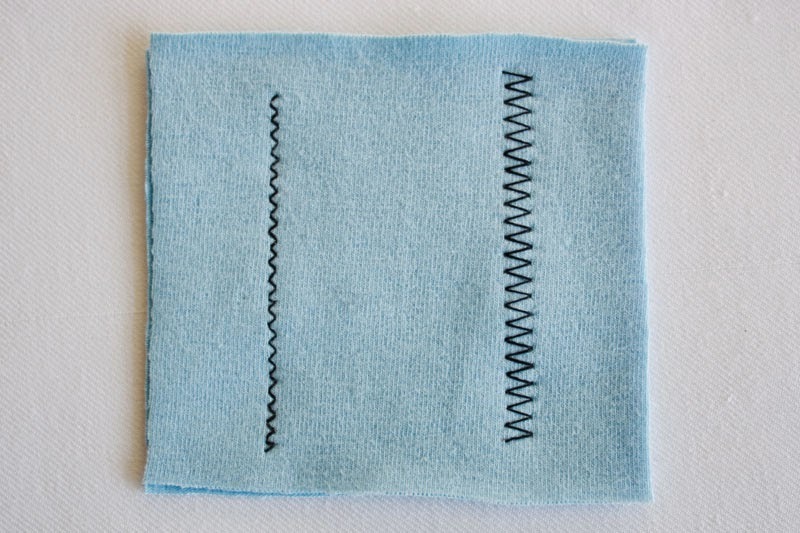 Some people actually advocate that you use a longer straight stitch over a zigzag or lightening bolt stitch. And guess what? I use a longer straight stitch on all the top-stitching for the neckline bindings on my Bronte tops and have never had an issue with the threads snapping. I'm just telling it like it is - am I going to be burned alive for saying that? Nope, I don't think so, and the reason for that has everything to do with my first paragraph, if it works for you, then keep doing it. I personally use a combination of the lightening bolt stitch (and there are people that will tell you that the lightening bolt stitch is the most evil kind of knit stitch - I have no idea why...) and a longer straight stitch for the top stitch. 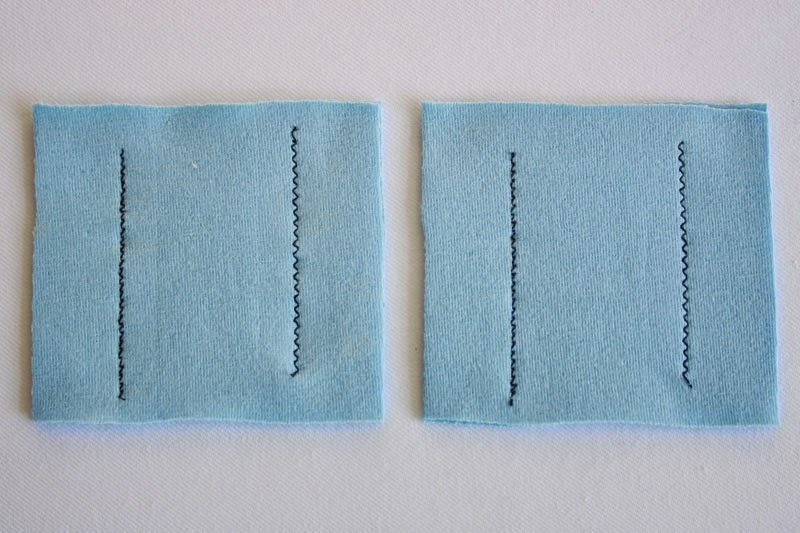 There are also other stitches, like the Triple Stretch Stitch (a super strong stitch), that you can use as well if your machine has these settings. Again, have a a play and see what works best for you. There's no right or wrong answer that will fit everybody's needs. If you can adjust the foot pressure on your machine, I would lift it up a notch or two. This will help the fabric slide under your foot much easier which in turn stops it stretching out as much as you sew. You'll notice the most difference from lifting your foot pressure at the smoothness of the fabric after you've sewn a seam. The sample on the left of the photo is sewn with the standard foot pressure I use when sewing with woven fabric, in both a narrow zigzag and the lightening bolt, you can see it's bubbly and wavy. 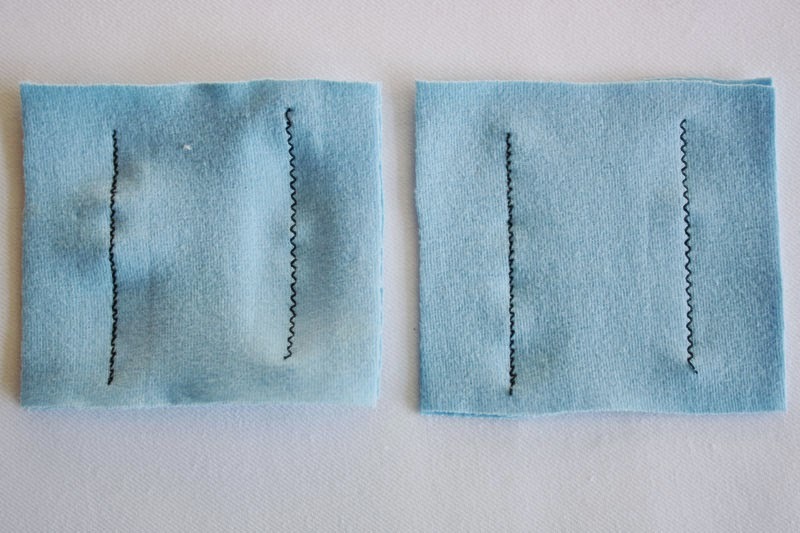 The sample on the right is sewn with the foot pressure lifted up a notch. It comes out smoother, since the fabric doesn't have as much pressure pushing down on it from the foot, and therefore doesn't stretch as much when you're sewing. If you can't lift the pressure of your foot (check your sewing machine manual! Mine was in an interesting place) don't worry, never underestimate the power of a good steamy iron. There are three types of needles you can get for sewing with knits - Ball-point needles, Stretch needles and Universal needles. I personally use ball-point needles for all of my knit sewing. The rounded head prevents the needle from piercing the stretch threads in your fabric and breaking them (therefore weakening the fabric) by moving in between the threads instead. Stretch needles do much the same, though their rounded tip is much lesser than a ball-point and the eye of the needle sits higher up. This is apparently better for super stretchy fabrics like swim suit lycra. I have personally never used a stretch needle before, but if you are getting skipped stitches from your ball-point needle, swapping for a stretch needle is suggested, as your fabric may react better to this kind of needle. Well, these guys are just that, they're universal which means you can use them on both woven fabrics and knits. Saves you time swapping out needles in between projects I suppose! All of these needles also come in different sizes, and the general rule is the heavier the fabric, the bigger the needle you should use. I buy ball-points in packs of 5 multi-sized needles which means if I'm having troubles, I can easily swap to a different size to see if that will fix the problem. Not all machines will allow you to play with your bobbin tension (hello sewing machine manual!). In fact, a lot of basic machines won't. However, if your sewing machine is being temperamental (skipped stitches, puckering etc), if you can play with this setting, it may help. I personally haven't had to alter this setting on my machine, but do give it a go if you've tried all the other options and you're not getting consistent stitches. Woah... if you made it to the end of that without falling asleep, I salute you. Anything I missed knit-superstars? Any questions knit-newbies? Any discussion about sewing with a straight stitch you wanna talk about? (Please be nice in my comments section! Everybody is entitled to their own opinions, whether you agree with them or not). 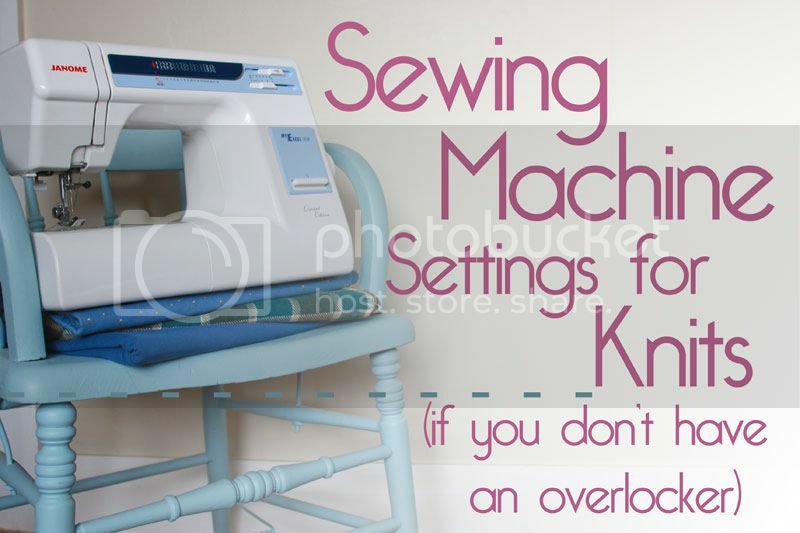 19 comments on "Sewing Machine Settings for Knits (if you don't have an overlocker)"
Thank you so much for this post Jen! I do have one question: When I have been topstitching the neckband on some of my T-shirts, sometimes the fabric will ripple, even though I have the pressure of the presser foot much lighter than normal. Any tips? I have been using a straight stitch up till now, but I think, now that I have discovered my barely perceptible zig-zag stitch (it looks like a straight stitch! ), I think I might try that and see how it works. I will also loosen up the top thread tension and see how that works. I'll let you know! Thank you for the great tutorial. I have found that every knit fabric is a bit different. Settings what is good for one might not to work for another. Always need to try a stitch out on scrap of fabric. Great summary Jen. I don't have an overlocker but have made heaps of knit garments and often use a combination of stitches. If I'm making something tight with both horizontal and vertical stretch I will use the lightening stitch as it gives better seam security than just a zigzag. An example of this would be my recent Nettie bodysuit or leggings - if you have to yank something a bit to get it on your bod then consider more than just a zig zag. For something with ease I'll just use a zig zag and only occasionally do I have to ever repair a seam. Sometimes I'll baste with a zigzag and go over it with the lightening stitch. A trick I've heard of to help with the wavy seams if you can't adjust your foot is to use tissue paper underneath the garment as a stabiliser. I've not tried this yet but many people swear by it. Sadly my machine doesn't do a straight stitch for necklines that won't break but I've found a zigzag that is set to 0.5 gives that tiny bit of stretch and the naked eye finds it very hard to see that it's not a straight stitch! Great tips!! Thanks so much for sharing, I love the idea of putting paper underneath your fabric if you can't lift your foot pressure. I have heard of people using both a zigzag and a straight stitch over the same seam for strength, but never a zigzag and a lightening bolt stitch - I'll definitely have to give that one a go next time I need a super strong stitch! Hehe, I hear you on the armscye seams - is it bad that I have an overlocker and still can't generally be bothered doing anything with those seams? Eeep! Well I think you could use the excuse that vintage sewists never had overlockers, so you're trying to be authentic! The main reason I'd do a zig zag then lightening stitch over the top is more to check fit, as my lightening stitch is just awful to unpick! Sometimes I grumble over using it as it uses a lot of thread, but then I guess an overlocker does too! Thanks for your great series on knits! I too like the lightning stitch, however I have learnt that it is essential to baste these seams first and double check the fit - unpicking lightning stitch results in tears of both varieties!! The triple straight stitch is awesome and I like it as a topstitching stitch on wovens as well (on a longer stitch length). I haven't tried it, but I have read that people like to use their walking foot for knits - not sure if this may help avoid some of the waving? Thanks again! Hehe, ooooooh yes, unpicking that lightening bolt is a pain in the bum! If you were to use a twin needle, you'd only really use it to top stitch the neckline bindings and for the hems on the sleeves and bodice, but I just do it with my regular ol' single needle, mostly because I'm lazy and can't be bothered finding a ballpoint twin needle (you'd need to find a ball point or stretch twin needle for knits), though I'm sure they're not actually that hard to find. My Janome has been amazing with knits, so even if you don't have the lightening bolt, a zigzag should work. Good luck!! Hi Jen, just to let you know that Spotlight (NZ) sell stretch twin needles. Best wishes. This is a great post with really useful information in. I don't have an overlocker and sew a reasonable amount of knits. I often use my walking foot too which helps to eliminate puckering, especially on light weight knits which my sewing machine doesn't like very much. Also, my favourite stitch for top stitching is the triple zig zag, I like the look of it and it still has the stretch element. Hi Jen, I have just purchased a serger but I intend to use my Janome sewing machine as well for knits. The most interesting thing for me was your tip about the foot pressure. I shall certainly keep it in mind. Thank you for this! I am just about to sew my first knit dress, so this comes in verrrry handy! !